Apple today introduced the new iPod nano, bringing video playback, an enhanced user interface featuring Cover Flow, and an new design to the company‚Äôs popular music player. The new iPod nano features a larger two-inch display with 204 pixels per inch, which lets users watch their favorite movies, TV shows and music videos in the same resolution they currently enjoy on the video iPod. The nano also includes three games, and additional games can be purchased from the online iTunes Store. The new nano delivers up to 24 hours of audio playback or five hours of video playback on a single charge. Squatty new design features anodized aluminum and polished stainless steel and comes in five new colors‚Äîsilver, black, blue, green and a (PRODUCT) RED special edition. The new iPod nano features a 204 pixel per inch display that is 65 percent brighter than the previous generation and delivers 320×240 resolution that is perfect for watching your favorite movies and TV shows on the go. iPod nano also features an enhanced user interface that shows off album artwork and photos like never before, and now includes Cover Flow, so you can scroll through your entire music collection by album cover artwork using the Click Wheel. The new iPod nano can play iPod games and comes pre-loaded with iQuiz, the entertainment trivia game; Vortex, a fast-paced 360 degree brick-bashing game; and Klondike, the popular solitaire card game. Additional games will be available for iPod nano later this month from the iTunes Store, including Sudoku and Tetris from Electronic Arts and Ms. PAC-MAN from NAMCO. Available today, the 4GB iPod nano comes in silver for just $149 (US) and the 8GB model is available in silver, black, blue, green and a (PRODUCT) RED special edition for just $199 (US). 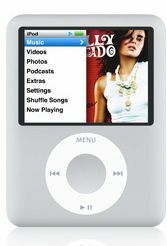 Both the 4GB and 8GB iPod nano for Windows or Mac are available worldwide immediately through the Apple Store¬Æ (www.apple.com), Apple‚Äôs retail stores and Apple Authorized Resellers. All iPod nano models include earbud headphones, a USB to 30-pin cable and a Universal Dock Connector.